I have a W/L 3 ticket for the Coromandel Express for the day after tomorrow. The ticket is in A/C 3 tier class which also has 18 RAC passengers in this train. So to get a confirmed ticket, I need to have at least 21 cancellations in the next 48 hours. However, I've noticed that the Coromandel Express has 21 tickets under Premium Tatkal quota. 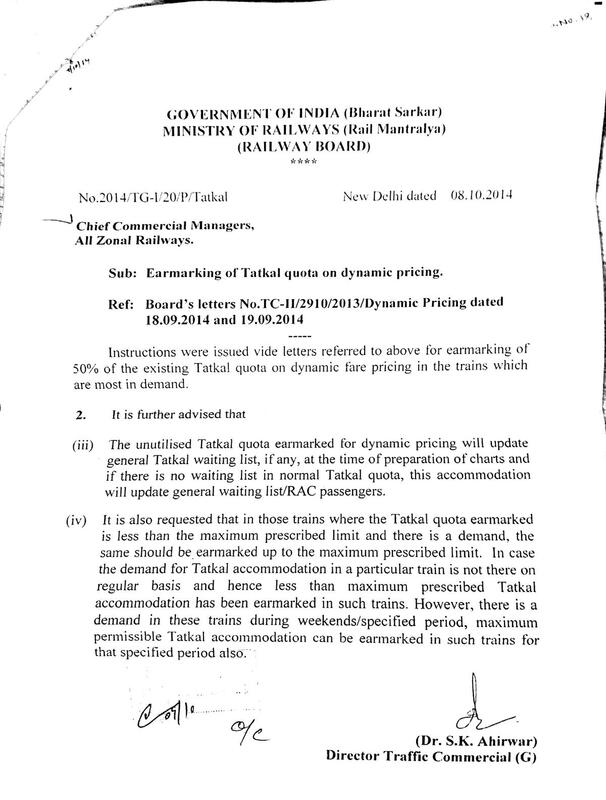 Everyday, although the Tatkal quota gets filled up, premium quota tickets are not booked because of the high prices. My question is, suppose say 10 Premium Tatkal quota tickets are not booked and the normal Tatkal W/L number stands at say 5. Will these 10 Premium Tatkal tickets be used to confirm the 5 normal Tatkal W/L passengers first (since Premium Tatkal may be looked upon as a subquota of Tatkal if you wish) or will these 10 seats actually upgrade the status of the general W/L (and hence RAC) tickets? Please note that my question is about the allocation of unused Premium Tatkal tickets and is not a duplicate of Do empty tatkal quota tickets get allotted to wait-listed passengers?. I found the document below issued by the Ministry of Railways while searching your query and it looks like an official government document to me, but I'm not sure about it's authenticity. Nevertheless, it clearly mentions (See point no. (iii)) that the unused premium tatkal ticket will first be utilized to fill the normal tatkal W/L as you suspected. The website where I found this document is this. Although its not an official website by the government of India, the undersigned official's name (Dr.S.K.Ahirwar) can be traced to an official site like for example here plus the date also looks OK because this scheme was introduced in October 2014. The left over seat of premium tatkal will be filled the tatkal waiting list first. Please refer the indian railway instruction last page. Not the answer you're looking for? Browse other questions tagged trains indian-railways tatkal or ask your own question.